Well the media isn’t going to get this done, emails need to be sent to every congressman in the US, other countries need to follow their own procedures. People need to contact their own “representatives”. Blog commenter rephelan has the right idea- he left this comment earlier. There are significant issues that need to be understood to properly react to whatever the magnitude of the global warming threat really is. Let’s keep this thread for people who left comments with their congressmen. Whatever these emails mean, it’s necessary to go through due diligence and find the breadth of the problem. Links to help people make contact more easily in any country can be left here as well. I’m going to do my part in Illinois. By now you must be aware of the release of thousands of e-mails and documents from the Climate Research Unit at East Anglia University by what is probably a conscience-stricken insider. The e-mails to and from some of the leading researchers in the field and key players in the IPCC, document attempts to manipulate scientific data, control the scientific review process, subvert FOI officers, destroy materials that should have been preserved under FOI regulations to avoid release, and the use misleading and deceptive information to influence both the public at large and policy makers. We have to think back to all the people who told us over the years that the IPCC is a “scientific organization” . This particular email has some huge implications in it which you really have to read a few times before you can close your jaw. I’ll bold some of the really shocking bits at the top but the rest is for you to work out. If nothing else, read the first paragraph and try and wrap your head around -first, the concept and second, the beating down of others reasonable points. F…ing amazing. scenarios-internally consistent (or so we thought) what-if storylines. provided by the synthesis team. These emails don’t often need commentary, here are the main dogs commenting on how temps have gone down. Mike Mann, Gavin Schmidt and others at RC as well as Tamino at Open Mind have been working feverishly to cover this up. A blogger Deep Climate snipped my post for even suggesting that preferred filters were used. He didn’t want anyone to suggest that the elites would exaggerate the trend. Well here it is right in plain sight. Statistically significant cooling being hidden on purpose – by alleged scientists!! This is an updated repost from a September 11, 2008. It’s was a popular post then but is far more relevant now that we see some of the bias in the recently released files. It has to do with hockey sticks in general but the graphs are from data used in Mann08, a paper by Michael Mann who is a key figure in many of the CRU emails. This post should also answer some questions of the newcomers at the Air Vent. 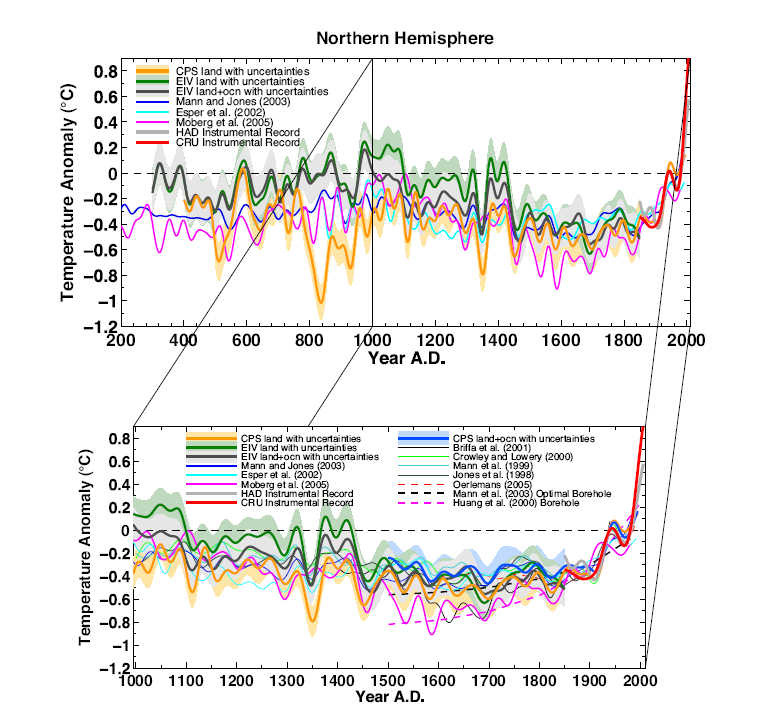 Most of us have seen a ‘hockey stick’ graph like the one below indicating temperature. It and others like it have been repeatedly used to demonstrate the recent warming of the earth. But how was it created? Certainly there were no thermometers being recorded in 1000 AD. This data is considered the powerful evidence of man made climate change. This graph clearly shows it is hotter now than in the past. Scientists often quote the rapidity of the rise in the blade as the reason warming is man made. For those of us who have been experiencing Climate Audit withdrawal, Steve has decided to run a mirror site on WordPress. Steve McIntyre was the center and subject of many of the emails and much of the controversy. He discusses the FOIA requests and what appears to be a collusion to block FOIA requests by government employees and climate scientists. Let’s see if we can crash this one too. There are several people who want to claim that these emails and data have no meaning, there are others who feel they spell complete doom for the global warming movement. We all have our own opinions on the matter and while this blog is not dedicated to moderate views, it is dedicated to real views. What the scientists need to understand is that their work affects everyone, and thus we have a right to know. Since there are many readers from the NYT which are visiting here. The Air Vent is described as dedicated to skeptical views. This is not accurate. The Air Vent is a site which accepts all views in a basically unmoderated form, however this blog started by me getting mad at Real Climate for a paper which from over a thousand proxies, throws away 60 percent of non hockey stick (inconvenient) data to make a hockey stick. – see the hockey stick posts link above. After that I got my official non-compliance label and was a ‘denialist’. At least the NYT has me in the middle somewhere. I don’t disagree with global warming but I do disagree that we know the magnitude of it. I also disagree that we know what temperatures were 1000 years or even 100 years ago in relation to today. These issues are not well addressed in the science as open minded technical people can see. If you are new and have a technical background (of any sort) and you read the links (hockey stick posts) above you’ll be asking yourself why the insanity of this can get through peer review and why it’s not a front page story on the New York Times. In my opinion it makes the emails look like child’s play. What’s more is that the hockey stick creators make one method after another which provide similar distortions of the data and FALSE temperature curves. In my opinion, ANY, statistician would say the same thing. — Several have. Ok, the little blog is running about 9 times higher volume than my old record. This means there are a lot of new people who are interested in understanding this issue. Believe me that as a technical blogger, the replies and emails read differently than if you’re checking this out for the first time. So one of the things I do is try to explain the issues the best way possible so not everyone has to be a climate scientist to figure this stuff out. It doesn’t always work but here we go. Despite what RC says, there are several glaring problems in these emails which Gavin Schmidt is working feverishly to gloss over. Here are the items I have a problem with. Discussion of interference with IPCC procedures to block low-warming reasonable and published papers. Discussion of removal of climate reviewers who are open minded to low-warming papers. The fact that in GRL this apparently occurred after these discussions is a problem. Discussion with the government about denial of FOIA to any climate audit blogger. FOIA is not meant to be for non-controversial topics it’s SPECIFICALLY for the contriversial ones. Free speech doesn’t protect nice words, it protects strong words. Data manipulation discussions. These are mostly hinted at except for a few instances but they are real and directed only toward strong warming. So now I have to provide evidence of these problems. Let’s look at RC’s reply which provides a nice foundation for our discussion. While Real Climate attempts to bullcrap this under the rug. Fox News has picked up the story as their headline post. They don’t know the issues like we do but still did a decent job. No mention of tAV – darn. It’s better not to be at ground zero though and several others linked here. The Examiner has had it for a while, as has the Guardian and the Telegraph. Rush Limbaugh carried it and the Drudge Report ran a piece. Are there any other MSM links around? The evidence is overwhelming. 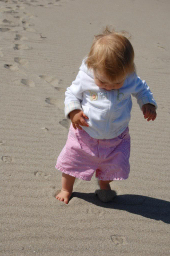 This baby was dug up by Lubos at the Reference Frame. An email which is published in investigate magazine from Phil was questioned by a reporter who obviously knows little about the issues of paleo. Phil Jones of HadCRUT, replied with an answer which was a flat lie in my opinion. All he had to do is tell the truth but he couldn’t when faced with the damming implications of what originally read to me as a carelessly worded email about a widely known horse crap data excising procedure in paleoclimatology. Instead, in the heat of the moment Dr. Phil chose deception. This email is copied from the report linked below. 20N. The latter two are real for 1999, while the estimate for 1999 for NH combined is +0.44C wrt 61-90. The Global estimate for 1999 with data through Oct is +0.35C cf. 0.57 for 1998. These emails are amazing. Look at how they collude to eliminate people they don’t agree with. This is truly awful. GRL has gone downhill rapidly in recent years. I think the decline began before Saiers. I have had some unhelpful dealings with him recently with regard to a paper Sarah and I have on glaciers — it was well received by the referees, and so is in the publication pipeline. However, I got the impression that Saiers was trying to keep it from being published. Proving bad behavior here is very difficult. If you think that Saiers is in the greenhouse skeptics camp, then, if we can find documentary evidence of this, we could go through official AGU channels to get him ousted. Even this would be difficult. How different is the GRL paper from the Nature paper? Did the authors counter any of the criticisms? My experience with Douglass is that the identical (bar format changes) paper to one previously rejected was submitted to GRL. Now again, this was spread on multiple sites before it could be contained. I took the link down the moment it became apparent what it was. In the meantime, it spread like CO2 spewing from an evil IC engine’s exhaust. Now that it’s everywhere, there are some incredible quotes and emails which should be and will be addressed. Below is one, allegedly from someone called Phil. Now I started this blog venting about the obvious politics of the IPCC and the control that scientists apparently had over skeptic publications. These emails have been incredibly revealing. We who are skeptical will hear no more criticism of our points that top quality skeptical papers cannot pass through review after these emails. There is widespread evidence here of active collusion to prevent papers which could be interpreted as skeptical from being published. In the alleged email below, a world famous “scientist” (a very loose interpretation of his job) apparently colludes with a bunch of others to refute a publication which does not conform to the ‘consensus’. He takes it to the point where he intends to put pressure on the Journal to remove the editor that allowed publication. You instantly realize the power these people have over the outcome of science. Hopefully it will give some insight into the science and the people behind it. This is the biggest news ever broken here. The first thing I have to say is that I have no connection to the source of these files. It was left as a link on my blog while I was hunting for cloaked deers (fruitlessly) in the Upper Penninsula. These files are real IMO but they cannot be one hundred percent verified as such. How can we be certain but IMO, real. They were potentially scraped from multiple computers in my opinion by a hacker or an insider involved in some of the endless FOIA requests. I’ll say this delicately – this person risked one f..k of a lot to show us this data. Ok, so the Air Vent stops posting for a few days and the world goes crazy. People really need to settle down but as predicted by your humble host, the rhetoric is ramping to unprecedented levels leading into Copenhagen. I wonder if rhetoric is what tree growth responds to? At least the scientists of this study waited until I was hunting apparently invisible deers in the Upper Peninsula to jump on this. The deers seem to have developed a unique cloaking technology, I hope the military is reading this. We should jump on it before it falls in the hands of the polar bears. Soon I have to organize the most extreme predictions of 2009 and get a vote together to decide the winner. Until now there have been a lot of serious attempts at first place with Hansen setting the ‘gold’ standard from previous years. I hope he’s paying attention too because lately there is some serious new competition in the fold. The study by Professor Le Quéré and her team, published in the journal Nature Geoscience, envisages a far higher figure. “We’re at the top end of the IPCC scenario,” she said. Professor Le Quéré said that Copenhagen was the last chance of coming to a global agreement that would curb carbon-dioxide emissions on a time-course that would hopefully stabilise temperature rises to within the danger threshold. “The Copenhagen conference next month is in my opinion the last chance to stabilise climate at C above pre-industrial levels in a smooth and organised way,” she said. “If the agreement is too weak, or the commitments not respected, it is not 2.5C or 3C we will get: it’s 5C or 6C – that is the path we’re on. The timescales here are extremely tight for what is needed to stabilise the climate at C,” she said. Meanwhile, the scientists have for the first time detected a failure of the Earth’s natural ability to absorb man-made carbon dioxide released into the air. They found significant evidence that more man-made CO2 is staying in the atmosphere to exacerbate the greenhouse effect because the natural “carbon sinks” that have absorbed it over previous decades on land and sea are beginning to fail, possibly as a result of rising global temperatures.